You probably wouldn’t think that man’s best friend was ever feeling so depressed that he might want to take the big plunge, but dog suicide is apparently a thing–whether they intentionally trip and fall or not. In West Dunbartonshire, Scotland lies a quaint little bridge designed by H.E. Milner. It’s popular not because of its beautiful architecture, though. The bridge has, for whatever reason, led to a number of dogs falling to their deaths. The international media, naturally, has taken a keen liking to this bridge and the phenomenon of dog suicide it seemingly perpetuates. You might come to think that dozens of poor pooches are leaping to their graves every year, but the number is closer to one annually. Still terrible, but things could always be much worse. While that isn’t so high when you compare the number of human jumpers at other famous bridges across the globe, it’s still worth noting when considering a somewhat less depressed animal–like the canine. After jumping, there is a fifty-foot drop to the waterfalls below. Researchers have since put a lot of thought into discovering why exactly these dogs are so attracted to the grim reaper and have found some interest factual tidbits that may or may not be related. First, dogs almost always jump from the same side of the bridge. Second, they usually do it when the weather is clear (granted, maybe people just tend to be more likely to take their dogs for a walk when it’s nice out–correlation does not necessarily equal causation, but you’ve probably heard that all before). Third, the dogs all have long snouts. Animal experts aren’t doing much better when trying to find a reasonable explanation. David Sexton decided to focus on the factors of sight, sound, and smell when investigating but decided to go with the latter factor when mice and mink were discovered underneath the bridge. He eventually concluded that the dogs were probably attracted to mink urine, but a resident hunter says no. According to him, there are no mink under the bridge and never have been. How they were discovered when they’ve never been there is a question for later. In any case, it does seem likely that the dogs who have leaped to their deaths from the edge of the bridge likely smelled something they liked. Dogs see with their noses, and when you like what you see, you go for it. Right? 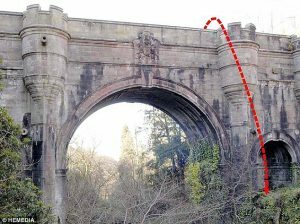 Sadly, strangeness surrounding the Overtoun bridge isn’t limited to dog suicide. In 1994, a man tossed his only two-week-old son off the bridge because, hey, that’s what you do when you think your just-born kid is the devil personified. The son was killed, but when the man tried to commit suicide the same way, he failed, later trying again in a more old-fashioned wrist slashing. He survived. Eventually, a sign was put up warning dog owners of the potential dangers of the wonderfully aromatic Overtoun bridge. Please, if you visit the famous bridge, do keep your dogs leashed. If you think your children are possessed by Satan, on the other hand, you should probably just take them to church and say a quick prayer. Previous Previous post: What Is The Dyatlov Incident?